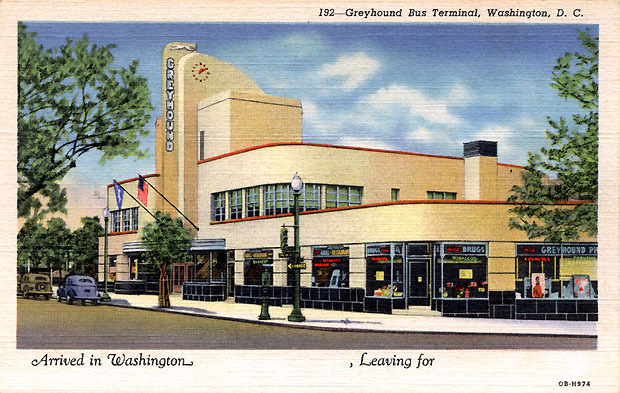 Greyhound bus terminals represent the democratic potential of American mobility. 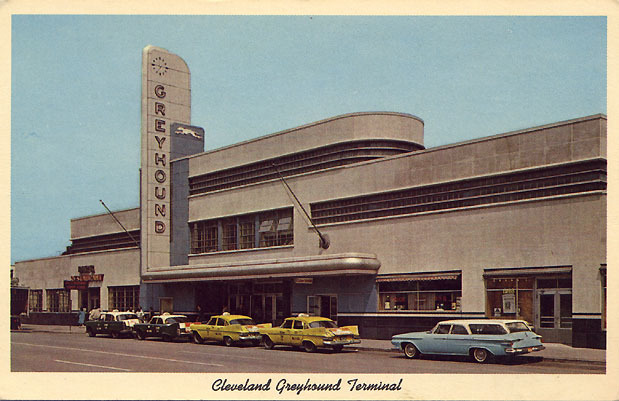 In towns, large and small, the galloping canine promised a one way ticket for anyone overcome by wanderlust. 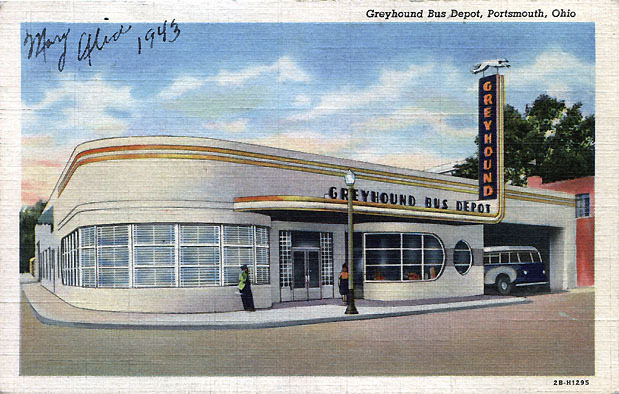 The depots also offered a greasy spoon for late night burger cravings, a chance to pick up a magazine, and long benches for late night slumber. 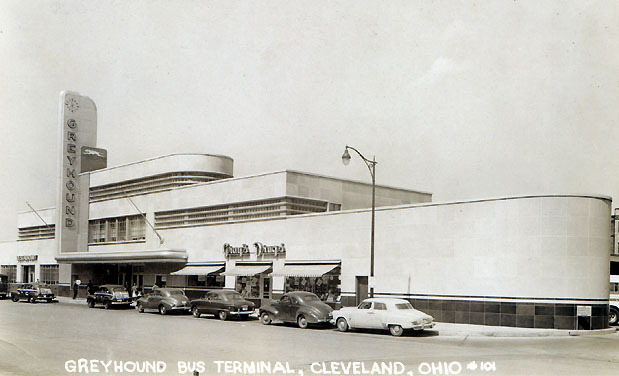 Soldiers heading for war, families heading for a new life, loners just passing through, pretty much everyone a generation ago spent some time in a bus terminal. 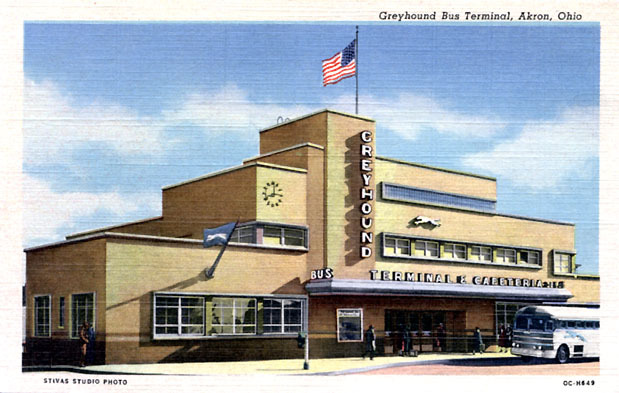 Greyhound began in 1914 when Carl Eric Wickman charged 15 cents for miners who needed a lift between Hibbing and Alice, Minnesota. 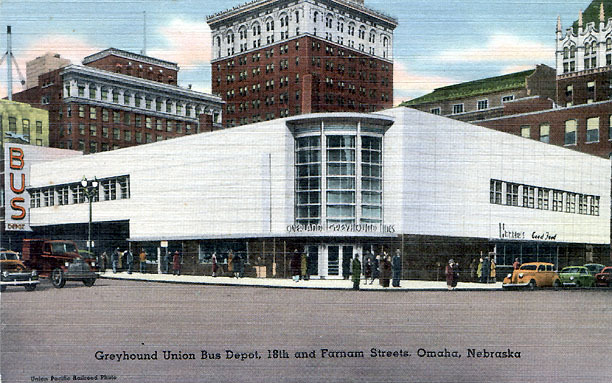 By 1927, bus travelers could cross the country, New York to California, in less than six days. 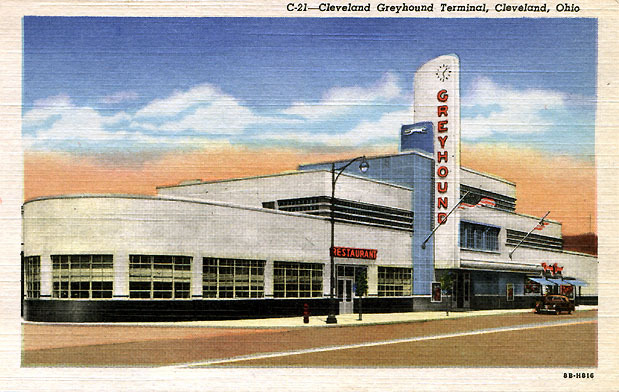 During the next three decades, Greyhound bus terminals drew from streamline moderne motifs - sweeping curves, porthole windows, and towering signage designed for the roving eye of the automobilist. 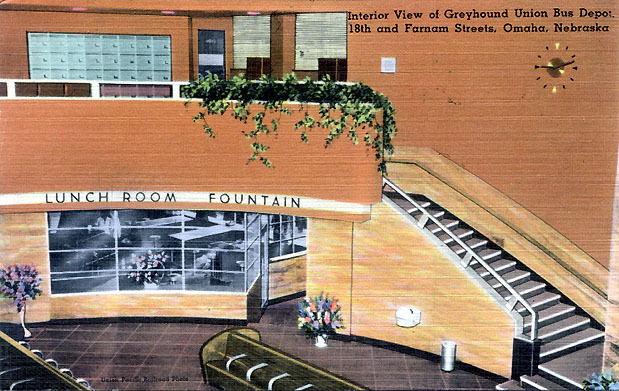 Inexpensive motion and fluidity were the promise of Greyhound's streamlined design. 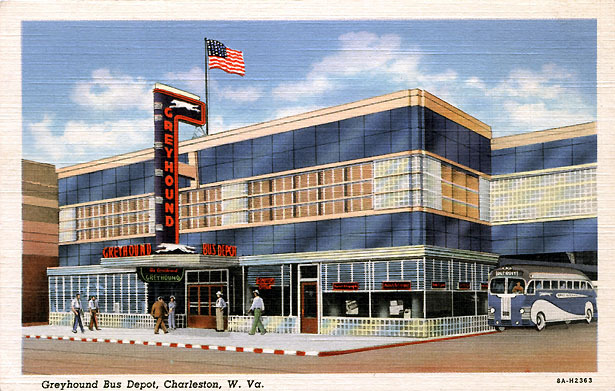 In 1956, the company introduced its slogan, "Go Greyhound - and leave the driving to us." But, the Interstate Highway Act of the same year offered mile after mile of blacktop to motorists willing to hit the highway on their own. 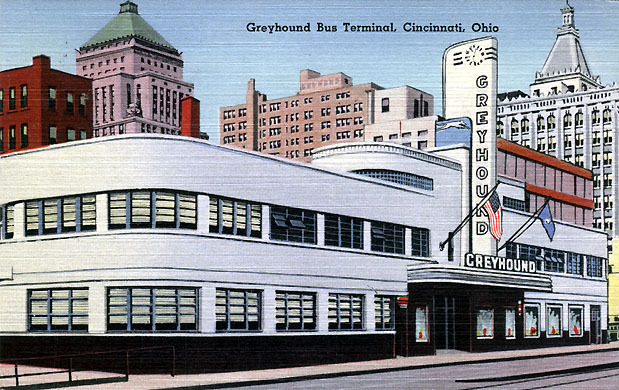 Fare wars, labor unrest, and unwise investments weakened Greyhound, but ensured that no other company would seek dominance in the nationwide intercity bus transportation business. 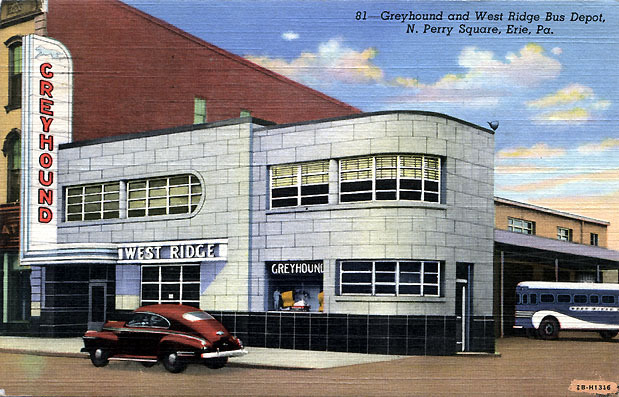 Today, you can find Greyhound depots across the country, but to recall their heyday, you must turn to more ephemeral sources - fleeting images found in photographs, pamphlets, and (of course) postcards. 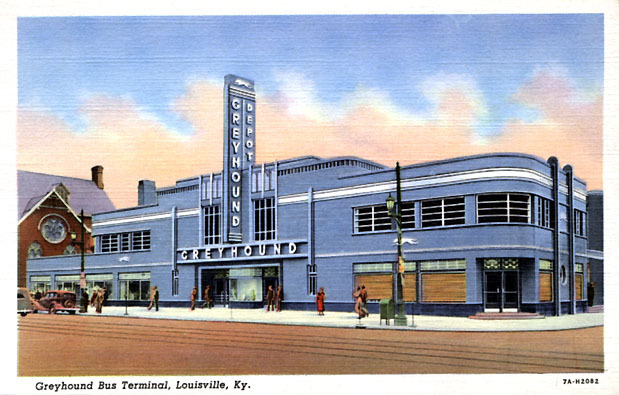 Much of the information for this note is drawn from the Greyhound timeline. While I do not claim copyright over the postcards themselves, I do claim ownership of the scanned images created specifically for this page. You may use these images if you provide full attribution to Andrew Wood. Want some more Deco? 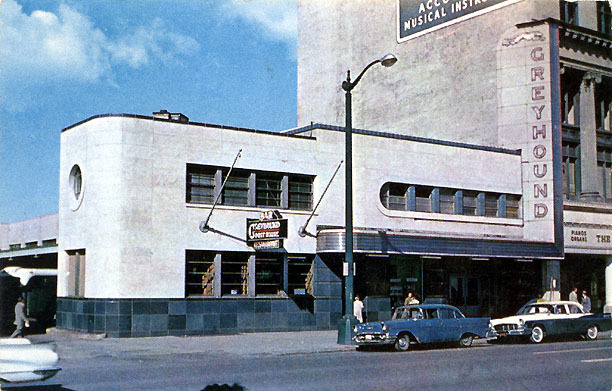 Check out South Bay Deco.